Goon democracy has clearly spoken! Nah, just Eurmaling you. Eurmali won. Aristocrats was my favorite, though. 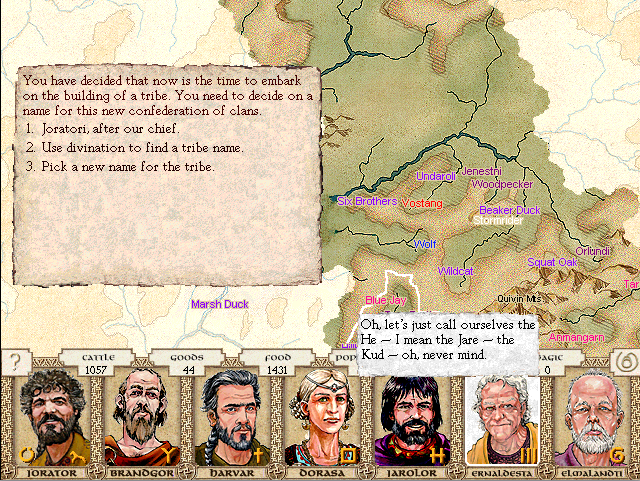 You can see the attitudes these tribes have toward us in this image. All of them like us except the Vostang(who are feuding with us), Jenestni, Woodpecker, and Orlundi(who are all neutral to us). Yes, that includes the Wolves(despite people's frequent worries about allies not necessarily liking you); the ring repeatedly insists the Wolves are our best friends whenever I go on the diplomacy screen, and we haven't done anything to piss them off lately, so there you go. 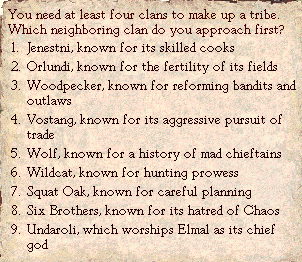 Now pick the first clan to approach for tribe-making from the list above. We should seek friends who know the meaning of the word "loyalty." The best allies are those who respect the rule of law. We must seek clans who have been tested in war. No point dealing with those too stubborn to know a good bargain when they see it. We must seek allies dedicated to peace. We must seek clans whose leaders have been tested in the crucible of crisis.